Ever since I was a little girl creativity has been part of my daily life in one way or another. Music became the biggest part when I was around 4 years old and at 5 I wrote my first song. It was a very short piano piece that I called “The Clown” and I performed it in front of about 50 piano teachers visiting from Japan. I can still remember that first feeling of having created something out of thin air and unable to explain where it came from. That’s the thing with creativity, for some people it might be easy to explain where they get their ideas from but for me it’s not. Sure I can point to a specific thing or incident that sparked an idea for a song, for instance after we had a rainwater leak through our ceiling that gave me the idea of writing a song about love being like water – it always finds a way. In general, my ideas and my creativity is something that I cannot really touch upon. It feels fleeting and even at times when I’m about to sit down to work and negative thoughts like “Oh will I actually be able to come up with something new? Maybe I have run out of ideas, yep the well has run dry”, I always end up coming up with something, just like magic. It’s almost like standing on the edge of a cliff every time, jumping without a parashoot and just hoping to land safely. That is also what I love, the unpredictable way that creativity takes me on a journey and shakes my ground. Growing up, what has been the biggest let down of all is how undervalued creativity is, it’s not a “real” job. Without digging any further into this, as it is a statement with many layers that deserves proper attention, I can mention that this is one of the reason that I am writing this blog post series. One thing that I have always found reassuring in the music industry is that the laws of copyright are so strong, they are there to protect the creators from others feeding off their creativity in a vicious way. Just like owning a shop on the high street where there are laws against people stealing from your shop (yes, I know this still happens but it’s illegal) there is something safe about the same laws and rules applying for intangible things like music and creativity. So when I entered into the crocheting community in the beginning of 2017 I was a little taken aback realizing that no such rules or laws were enforced here. It is like this lawless land where sneaky thieves can nick not only your photos from instagram and your homepage, but also copy your patterns and sell them as their own. To say this scares the hell out of me is an understatement. 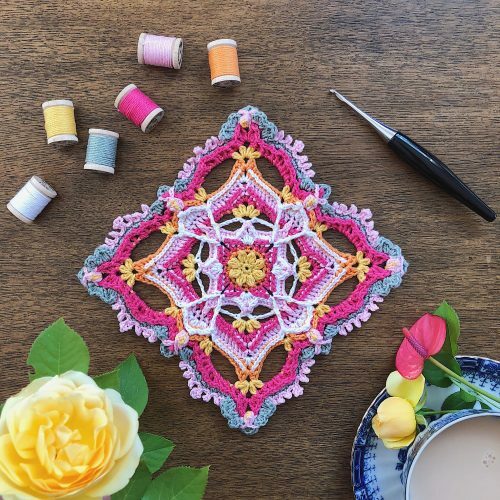 Handcrafts like crocheting and knitting have in the last few years stepped out of the old lady closet, and into social media with a big bang. They are fast growing, open and generous communities and that’s just some of the reasons that they become so vulnerable. Now I can’t knit to save my life so I can only talk from a crocheter’s perspective, also I am using Instagram as the main platform for this discussion. We share our process and we give away all of our tips and secrets, now I think this is beautiful and just the way it’s supposed to be, the problem is those who take advantage of this. You can argue that it’s only companies trying to make profit, but we need to be real about this and see that it’s also individuals who without batting an eye have no problem taking someone else’s hard work and claiming it as their own. Small accounts and big accounts, stealing ideas and copying patterns and there is nowhere for anyone to turn when this happens! Before this huge thing called the internet, handcrafts were handed down through generations, taught from mother to daughter and spread through books and magazines. I’ve heard people mention in discussions that in the “good old days” people didn’t have the privilege of copyright so it’s not such an important thing to implement now – I would say this is a very ignorant way of defending something that is actually criminal (don’t even get me started on the fact that this is a female dominated arena). There are copyright laws within every creative field, and just because we are unlucky enough in our community not to have a copyright society to enforce these laws and to push criminals up against the wall does not mean that we should let this become a non-issue permitting this behaviour to continue. We need to stick up for, and take care of this open hearted community of ours, letting people steal, loot and feed off others’ creativity is so destructive and not something I look upon lightly, and neither should you. And no, I am not suggesting that you cannot draw inspiration from others, that is a completely different thing and should not be confused with the copyright infringements that I am referring to. What is copyright, how does it work and what does it do? Why did copyright come about and where is it today? How does it work in music and why is this applicable in crocheting? How does it work now? How do people tackle their patterns being stolen? Why is it important with copyright in the crocheting community? What can we do? What do we need? Ideas of solutions and ways to handle copyright infringement. Is a copyright society needed? There just aren’t enough stitches! A better late than never introduction of me. Oh and maybe I should introduce myself? I am Kay, I am a songwriter, I have worked as a music publisher and now I am a crochet designer. I am not claiming to have all of the answers, I am simply trying to open up this discussion that needs to be held – using my previous experience in this area. My plan is to start releasing these chapters starting in 2019 to make sure that I give sufficient time for anyone with initial questions, ideas and thoughts to contact me and share those thoughts. So please don’t hesitate to contact me at sistersinstitch(a)gmail.com with your thoughts and insights, I would love to hear what you think and what your experience is because everyone’s story is unique and equally important. Can’t wait to see you back here for chapter 1 in the new year, till then I wish you many hours of crocheting fun! ‘Stepped out of the old lady closet’?! How ageist and discriminatory is that? There are actual laws about that too. With crochet it is hard to be original. Most combinations have already been done. You see many designs the same in books, and everywhere. How can anyone possibly know they are doing something first? No one can. As for those old ladies, well do you want your work dismissed as not being important when you become old, if not then change how it is now. Those self same old ladies used to be young too and helped develop the craft in order for you in turn to learn. Nothing any better about modern designers or younger ones than any other age. Will it feel nice to have people laughing at your work in the future – that you dedicate so many hours to. I am neither old nor young. Do we have to be divisive? If you perceive this blog post and that specific line of words ageist and discriminatory I can only send my deepest apologies to you. This was never the intention as I do hope you can understand when reading the whole text. I was simply making a point of the fact that what has previously been perceived by the masses as a handcraft only done by older women it has finally started to be seen as something for everyone. With regards to crochet being a craft hard to make original we will just have to agree to disagree. I simply do not see creativity, in any way shape or form, to be limited to works and ideas done in the past and by others. I’m trying to see where in my words I am claiming that modern and young designers are better, where I am laughing at others works and creations and even give the slitest impression that I am dismissing older generations. I simply can’t find that. This text is written with regards to copyright issues, something that is a huge problem within the crochet community and frankly not talked about enough. Thank you for you comment, hopefully you will enjoy the rest of the blogpost about copyright coming out in 2019.